I'm in the prime of my life, and I have a hearing loss! Now what?? It can be shocking and dismaying to realize that you have trouble--sometimes a lot of trouble--hearing now, when everything used to be fine. You are not alone. About one in eight people aged 18-66 in the United States has a hearing loss, totaling over 23 million working age adults...that's about as many people who live in the state of Texas! Although hearing loss can be devastating, you can also do a lot to make your life better. New technologies have made obsolete the cumbersome "ear trumpets" of previous centuries, and promising research may in future years result in an actual cure for hearing impairment. Still, though, when you start to manage your hearing loss, you face a blizzard of questions and issues. What is the best amplification for me? How do I pay for it? How can I hear better in noisy restaurants or in meetings at work? Is a hearing service dog a good choice for me? As first and second steps, peruse the pages and links on this website, and read Sound Sense: Living and Learning with Hearing Loss, an awesome self-help book especially for working-age people who find themselves with a hearing loss. Whether you're a 25 year-old veteran returning from combat with a hearing loss, or a 38 year-old working mother considering cochlear implants, or a 66 year-old rock music lover still going strong in your career and thinking about getting hearing aids, you'll find oodles of great information and resources Sound Sense for managing your hearing loss and living a fulfilled and satisfying life. Sound Sense is also available in many local libraries, and from many online bookstores. Read the chapter on staying healthy, and be sure to try the chocolate truffle recipe! Try using closed-captioned workout DVDs in the comfort and privacy of your own home to improve both your body and your mind. Public libraries and online DVD rental services have many fitness DVDs, and more production companies are captioning these products. Look for the "CC" on the back of the DVD case, or in the online description. 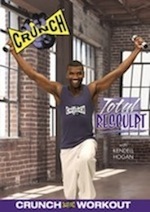 Check with your doctor first, and then check out our review of the Crunch Total Resculpt workout led by super fitness instructor Kendell Hogan. More information, resources, and smiles are on the way. For custom demographic research or consulting, please see our Contact page.